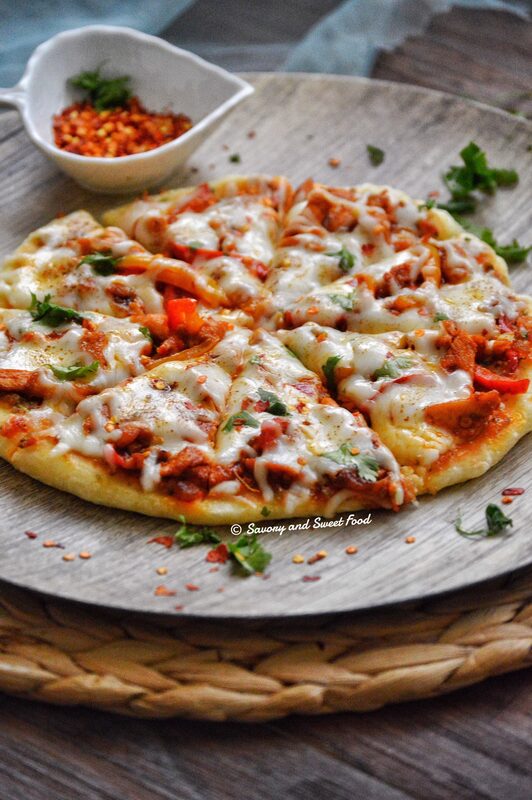 Chicken Fajita Pizza, a very spicy and flavorful pizza with the Mexican flavors. It has salsa, chicken fajita mix and lots of cheese baked on a crispy crust which is cooked on stop stove top in a skillet. I totally love Mexican flavors and this pizza is full of them. It is spicy and with each bite you can feel a flavor explosion in your mouth. That’s what I love about Mexican food, it has got the heat, and strong flavors, a little like our Indian food. The main thing, it is not bland. I don’t like bland food..nope..that’s not for me. 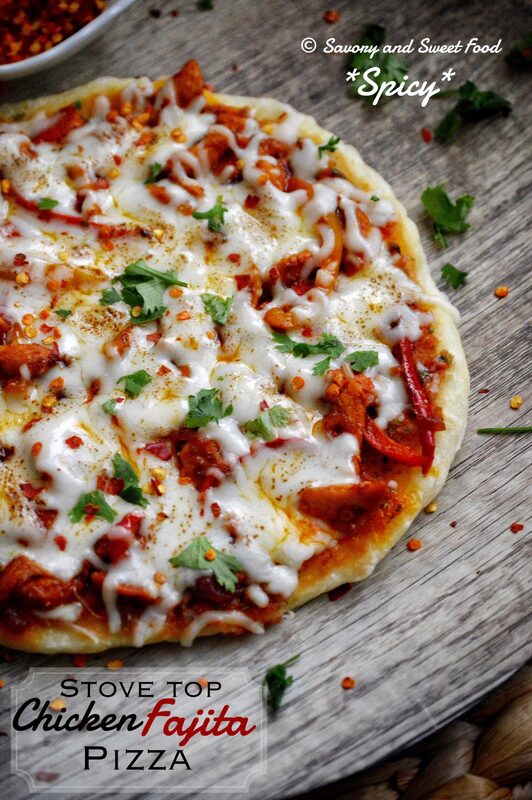 This pizza is certainly crave-worthy. I can attest to that. And don’t worry if you don’t have an oven. 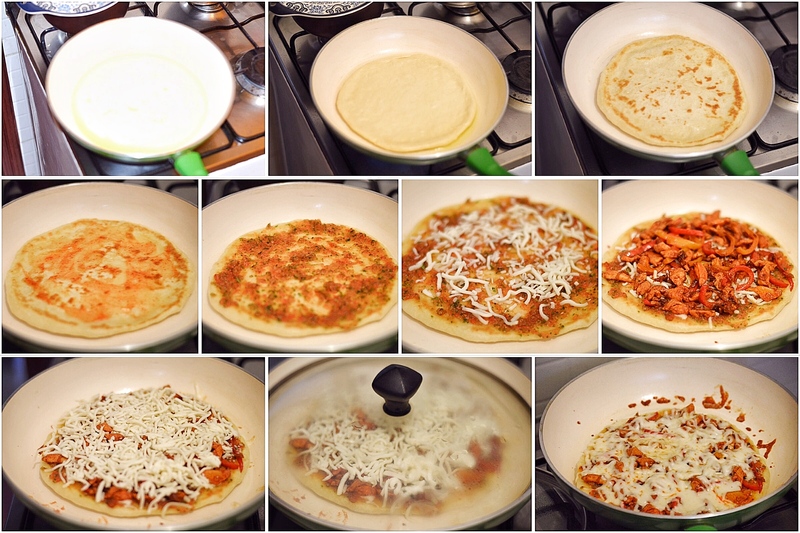 I will show you how to make perfect pizza without an oven, on a stove top. You will only need a skillet with a lid for that. I can see myself using this technique to make my pizzas from now on. I find this more easier than the oven method. 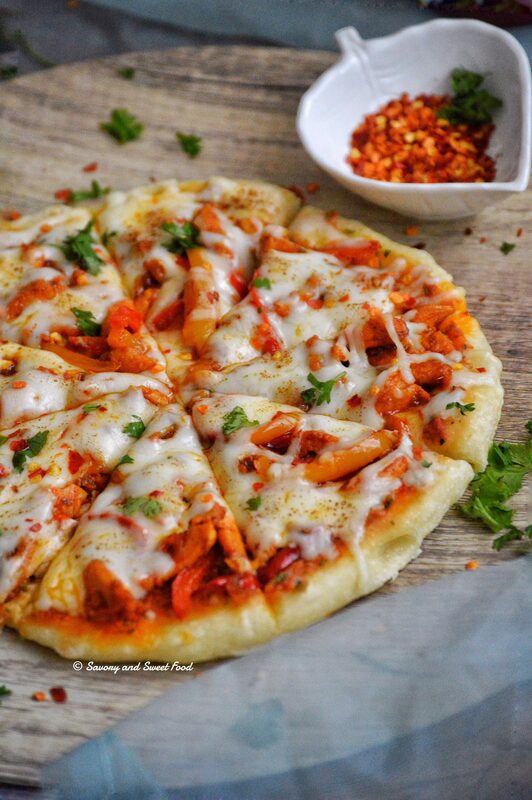 Just check it out, I know you will enjoy this pizza a lot. Hope you all will give this a try. With this crust, you can make one large pizza. But if you don’t have such a large pan, divide the dough into and make two pizzas. If you want the top part of your pizza to be more crisp and the cheese to be browned a bit, place the pizza into the oven with the broiler on for few minutes till it turns golden brown in color. In a large mixing bowl, combine 1 cup flour, sugar, yeast, butter, salt and oil. Combine well with hand till the flour resembles bread crumbs. 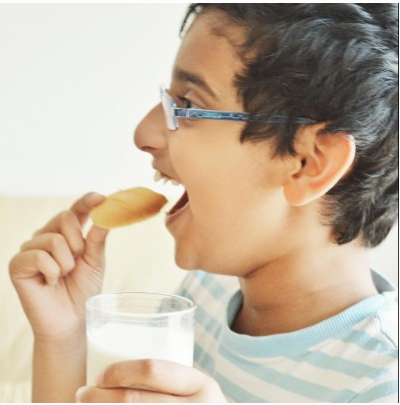 Mix the milk and water in a pan and slightly heat it till it turns warm (not hot). Pour this gradually into the flour mix and knead. The dough will be very sticky at this point. Add in more flour till the dough gets smooth and elastic but not dry. It should be slightly sticky and feel tacky. I added 1/4 cup more of flour. Resist the urge to add more flour or the crust will become very hard. Knead for 2-3 minutes. Transfer the dough into a well oiled bowl and turn it around to get it covered with oil. Cover the bowl with a plastic wrap and keep it in a warm place and let it sit for 1 hour till the dough gets double in size. Marinate the chicken strips with the above mentioned ingredients and shallow fry till cooked. It will only need 10 minutes of cooking. Take it off the pan. In the same pan add in the capsicum and onion. Sauté for a minute or two. Add in garlic powder, paprika and salt. Sauté for a minute. Add in the fried chicken strips into the pan again and mix everything together. The fajita mix is ready. In a food processor add in all the ingredients and chop it till its very fine. 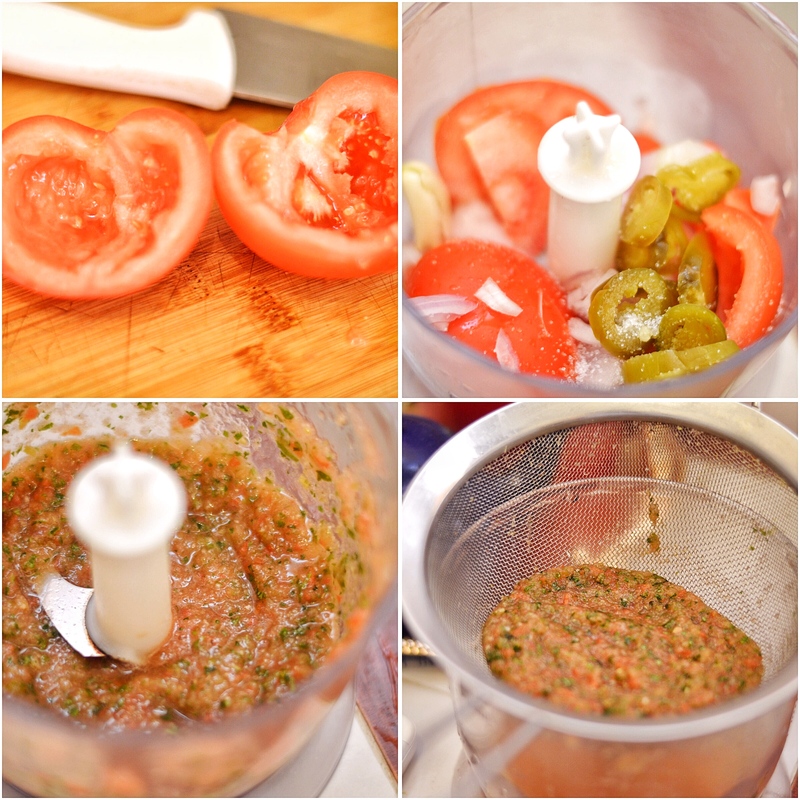 Drain the salsa to remove excess water. Take out the dough and cut it in half (If you are using a big pan roll the entire dough into one circle). Roll the dough thin as it will bounce back and become little thick while you place it in the pan. Roll out one half of the dough into a circle slightly smaller than the size of your pan. Take a skillet (cast iron, non-stick) with a lid. Keep it over medium high heat and add in a tsp or two of oil just to cover the base of the pan. Transfer the rolled pizza dough onto the pan. Cook for about 1 minute or until you start seeing bubbles forming on top and the underside turns golden brown in color. Use a spatula to flip the crust to the other side. Reduce heat to low. Immediately start adding the toppings to the crust. Start with few spoons of sweet chilli sauce. Spread it evenly. Then spread the salsa all over. Add in a little mozzarella cheese. 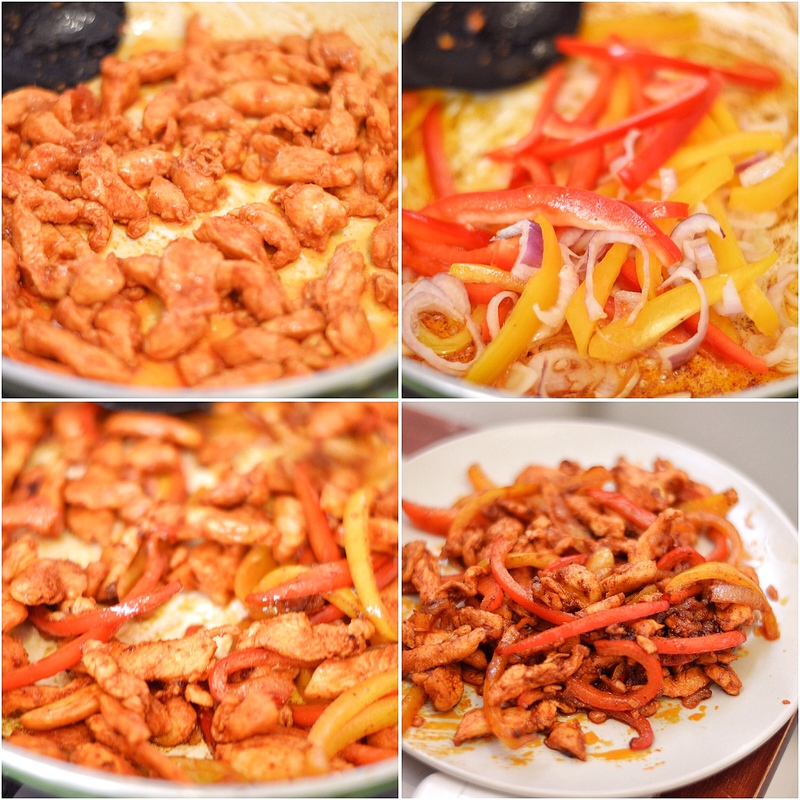 Place the chicken fajita mix. Finally add in a layer of mozzarella cheese. Cover the pan and let the cheese melt completely and the bottom get browned and crisp. Be careful that the bottom doesn’t get burned. Remove from heat sprinkle chopped coriander leaves and chilli flakes. Cut and serve hot. 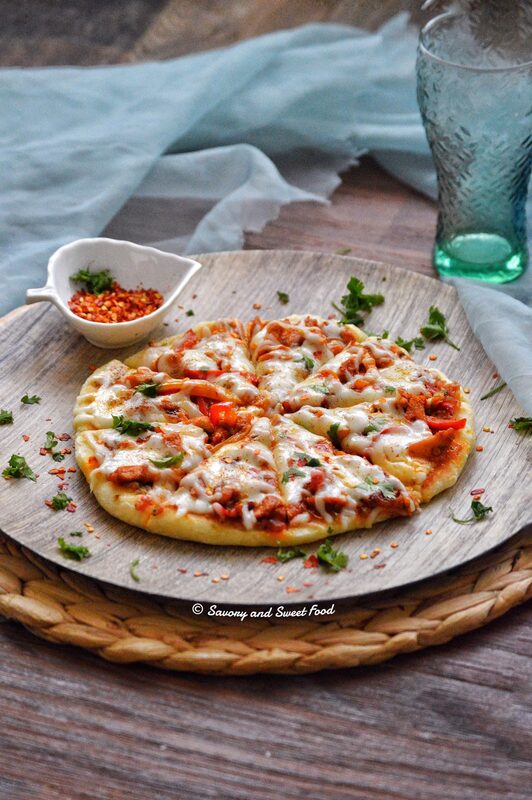 A very spicy and flavorful pizza with the Mexican flavors. 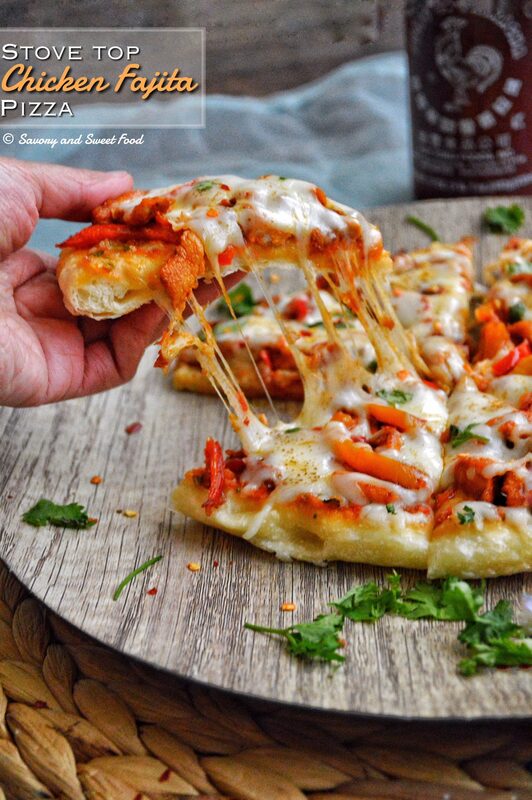 It has salsa, chicken fajita mix and lots of cheese baked on a crispy crust which is cooked on stop stove top in a skillet. Cover the pan and let the cheese melt completely and the bottom get browned and crisp. Be careful that the bottom doesn't get burned. With this crust, you can make one large pizza. But if you don't have such a large pan, divide the dough into and make two pizzas. This looks amazing!!! First pic is so appealing, looking at it makes me cook this dish so bad!! Thank you . Hope you will try this sometime. Hi i would like to know if we can substitute the instant yeast with active dry yeast ? And also will the results be same if we bake it in oven? Your recipes are awesome!..Masha Allah..Thanks so much. Hi Nabila! Thank you soo much. Yes you can use active dry yeast too. But remember to proof it before adding to the flour. Do not add it directly to the flour. And yes you can bake it in the oven too.